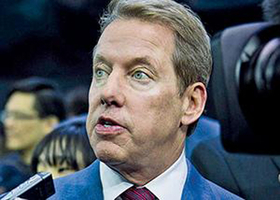 DETROIT -- Bill Ford is tired of hearing the future of cars belongs to Silicon Valley. Yet for years, the Apple and Google crowd have been telling him that only Big Tech can make driverless vehicles. He’s not kidding. Tech giants Apple Inc. and Google, once intent on disrupting, if not destroying, Detroit, have concluded for now that they don’t want to build cars. Sure, they still bank on supplying the autonomous software that will drive robot rides, but the concession that they’re not up to the complex task of mass production tilts the balance of power to traditional automakers. Vehicle manufacturing is a massive undertaking. There is the metal bending and assembly, a highly evolved process in itself. Car companies also integrate millions of lines of code that control everything from the radio to the radar sensors that will soon allow hands-free driving. Detroit also has deep experience managing the long chain of suppliers that provide roughly 30,000 parts. Google co-founder Larry Page came to that conclusion when he confided in a private discussion earlier this year he was heartbroken by the slow pace of the company’s self-driving car project, said a person familiar with the meeting. Though Google began its autonomous-driving efforts well before other tech companies, its project has been plagued by uncertainty around its business model and executive departures. A Google spokesperson declined to comment. Automakers, meanwhile, are pouring billions into developing their own self-driving systems. They’re already installing semi-autonomous features, such as automatic braking and technology to keep a car in its lane. And they’re working on building models that can withstand the punishing workload expected of robot taxis, which will likely amass 130,000 miles a year -- 10 times today’s total -- as they run 18 hours a day, 365 days a year. The robot rides will be replaced often and sold in high numbers, providing a big payoff for manufacturers that figure out the formula. That’s not to say auto companies haven’t tried working with Silicon Valley. Volvo Cars is providing SUVs to Uber Technologies Inc. for testing as robot taxis in Pittsburgh. Fiat Chrysler Automobiles is supplying Google with 100 minivans for transformation into self-driving people haulers. Those deals could herald larger alliances. For now, the two industries view each other with suspicion. Each wants to stake its own claim to a driverless future and reap the rewards. Toyota Motor Corp., Volkswagen AG, General Motors and Ford have all conducted extensive talks with tech giants such as Google or Apple but in every case failed to come up with a way to share power. Tech companies believe they could boost anemic margins in auto making if they had access to vehicle-performance data that would allow for more efficient manufacturing. Car companies control that data now and are unlikely to release it to a competitor. However the power-sharing arrangement shakes out, no single company will “own the brain” of the autonomous car, said Swamy Kotagiri, chief technology officer of Magna International, a veteran contract manufacturer that will build the BMW 5 series. Automakers probably will control safety systems, while tech companies will handle “enjoyment, convenience and comfort data,” such as Apple’s CarPlay dashboard infotainment system, he said. Where automakers come up short is attracting sufficient numbers of software engineers, which they lack by the thousands. Technology now represents half the cost of a car, according to Gary Shapiro, president and CEO of the Consumer Technology Association. But luring tech talent away from Silicon Valley hasn’t been easy. Car companies are trying to fix that. GM’s US$1 billion acquisition of self-driving startup Cruise Automation has helped the automaker attract talent, CEO Mary Barra told a tech conference in Detroit last month. Meanwhile, GM and Ford are expanding their Silicon Valley research labs, but their presence and reputation still lags the tech players. That’s why U.S. automakers and suppliers are working hard to develop the Detroit area as a competing centre of autonomous automotive development, with robot-car test tracks and r&d facilities.